When you mention the word scorpion, many people immediately think of an aggressive beast with large pincers and a nasty sting in its tail. Part of that is true – they do have pincers and a sting in their tail – but there is more to scorpions than meets the eye and they aren’t quite as aggressive as you think. Scorpions are arachnids, so they are related to spiders, ticks, mites, harvestmen and a few other invertebrates that share the arachnid trait of having four pairs of legs, but they are perhaps the most ancient of the lot. 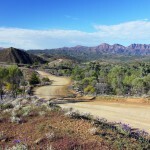 They have existed relatively unchanged for 450 million years and were one of the first creatures to make the break from water and take up a terrestrial lifestyle some 350 million years ago. One of the keys to their successful transition is their exoskeleton, their outer armour, which is very well sealed and doesn’t allow much water loss, so they can survive in arid regions. In fact, they don’t drink and their only moisture comes from the food they eat. 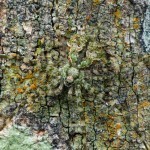 Plus they have adapted to a variety of climates and can overcome a lot of life’s challenges. They can survive extremes of temperatures, hot and cold, and they can get by without feeding for a long time, sometimes months or even a year. Living in burrows and only being active at night helps a lot of species avoid harsh daytime temperatures. This also means they are not often encountered during the day, so despite how common they are, human contact is minimal. Most cases of scorpion stings are a result of chance encounters like digging one up in the garden, and scorpions only sting as a means of defence, not as a deliberate act of aggression. There have been no confirmed cases of fatal scorpion stings in Australia. The two dozen or so deadly species are found elsewhere in the world. 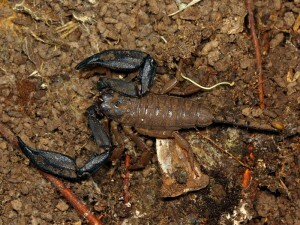 As I mentioned earlier, all scorpions have eight legs. Their pincers are not legs but are in fact modified pedipalps (spider pedipalps are used as sensory organs and, in the case of male spiders, they are used to transfer sperm to females). A scorpion’s tail consists of half a dozen or so segments. 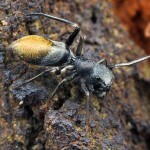 The last segment, called the telson, houses the venom glands and is tipped with a sharp sting. 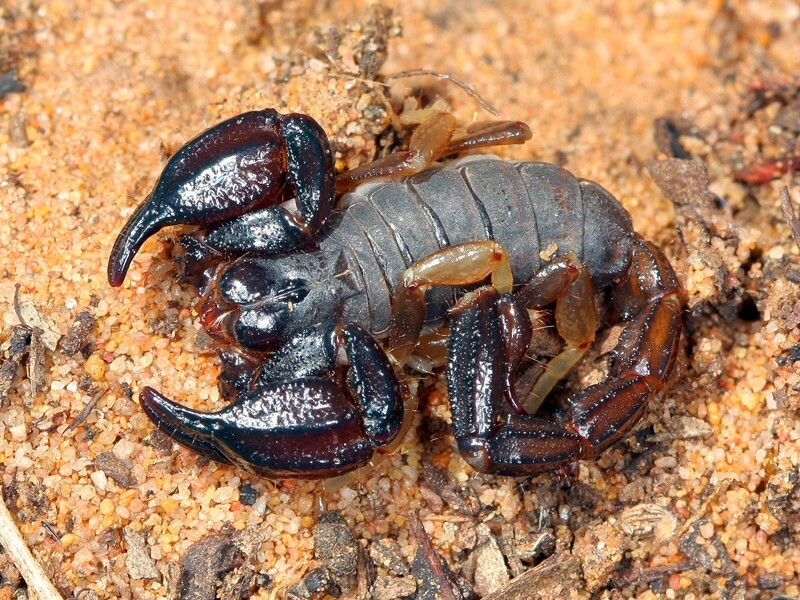 All scorpions are predators and they will eat other invertebrates, including each other, and some small vertebrates, so it’s pretty obvious what the main purpose of the sting is. 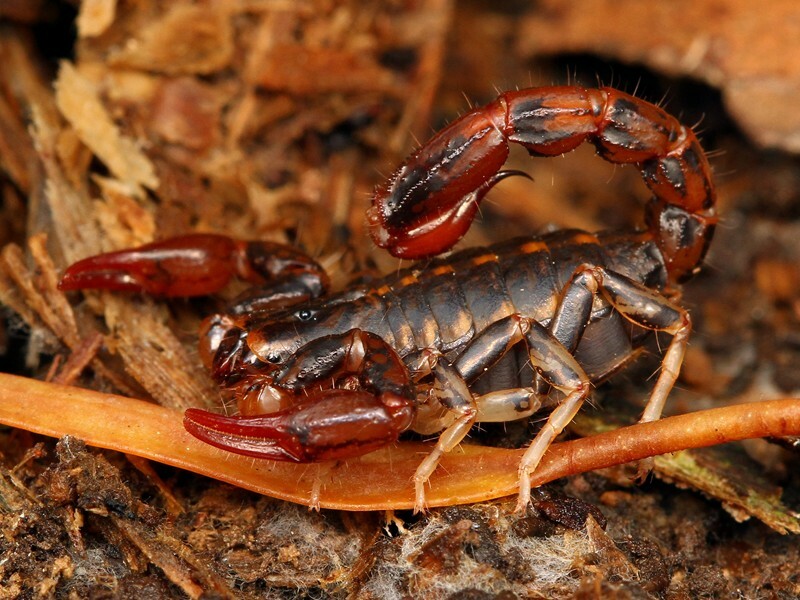 Male scorpions take their lives into their own hands during the mating season. Females will often try to kill and eat males, so part of the strategy is for the male to hold the female’s pincers with his own and avoid her sting and this becomes a type of courtship dance as he tries to placate her. The male releases a packet of sperm on the ground and gently guides the female over it so she can take it up into her body and then with a bit of luck he can let go of her and beat a hasty retreat. Scorpion pregnancy can last as long as 18 months and the females give birth to live young, which she will protect and carry around with her for a few days or a few months. Because scorpions have very low metabolic rates, they are slow growers. They moult an average of six times during their lives and they can live for 2 to 25 years, depending on the species. There is no doubt that scorpions are one of nature’s true success stories and they play an important role in many ecosystems. As much as we fear and despise them at times, we should be grateful they are not the meter-long beasts that they once were in ancient times. Marbled Scorpion, Lychas sp., a small species found in and around Melbourne, Victoria.